Welcome to Oxford Talking Therapies. We are a professional partnership of clinical psychologists and CBT specialists providing therapy to help people find a way forward through difficult emotional issues. Our aim is to bring meaningful and lasting relief from psychological suffering by providing an environment to explore and nurture positive change to the way we think, feel and act in our everyday lives. Many of the above conditions have been subject to extensive research including the providers of national guidance NICE (National Institute for Health and Care Excellence). stress, grief and bereavement, trauma, unstable mood, worry, interpersonal and relationship difficulties, anger, workplace/school problems, addictions, adjustment to life events and transitions, anger, low self confidence and self esteem, sleep problems and coping with chronic health problems, disability and pain. In our initial assessments we formulate an individual's difficulties whilst working with them in order to understand and explore alternative ways of coping and functioning, and hence work towards the amelioration of distress. Our interventions include longer and short-term cognitive behavioural therapy (CBT) and cognitive and behavioural informed therapies. Besides individual psychotherapy we also offer couples counselling and CBT informed life and business coaching. We would initially provide a full assessment in order to look in detail at your problems and work with you to develop an intervention that has the best evidence for recovery according to clinical trials and NICE guidelines. 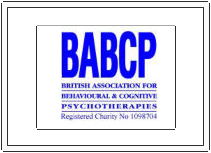 Oxford Talking Therapists are all registered with their core professional organisations: Health and Care Professions Council (HCPC), British Psychological Society (BPS), Nursing and Midwifery Council (NMC) and the BABCP (The British Association for Behavioural and Cognitive Psychotherapies).